The Bicentennial of the United States Civil War is still being celebrated in many places including the annual celebration of the Historic Fort Wayne Coalition. Please notice Historic Fort Wayne is in Detroit. From 1701 through World War II the location was an active military location. Today the Historic Fort Wayne Coalition is working to preserve as much of the fort's heritage as possible. Toward that, I'm proud to continue being part of the annual celebration. While portraying Liberetta Lerich Green I will talk, among other things, about how her brothers, Will and Isaac, mustered in and out of the fort for the Michigan Fifth Infantry and later Isaac returned when the Third Infantry was reconstituted. I will also tell of her family's abolition and Underground Railroad work and life on the homefront. In addition, Liberetta joins General Grant's widow, Governor Blair's wife, and Sarah Edmonds in the Commanding Officer's house. All of these women have fascinating stories worth hearing. Music is a great way to recall these events. In telling Liberetta's story I use the abolition song, "Roll on the Liberty Ball", which was written by the Hutchinson Family Singers to the tune of "Old Rosin the Beau", then used again as the election song, "Lincoln and Liberty, Too" . The YouTube video above merges the two songs. It comes from ex-Weaver, Ronnie Gilbert, and gives a lively amalgamation of both while incorporating pictures from the era. Today's story is a remembrance by Richard Wentworth Browne in The Century Magazine, from January 1888. The Online Books Page has an archive of the magazine from its origins in 1881 up through Volume 97 on April 1919, although the magazine didn't cease operation until 1930. It's always worth checking periodicals of a period for a time travel experience. The story was part of a larger article, "Memoranda on the Civil War." 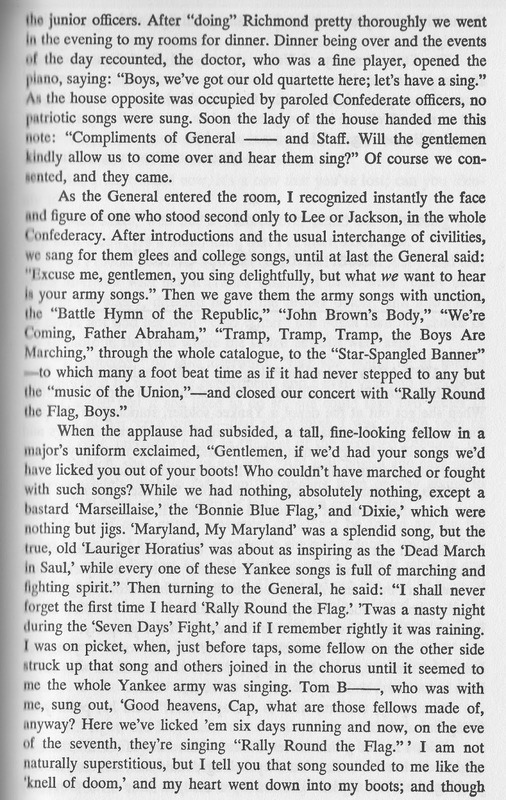 Browne also explains he was inspired to write after reading Brander Matthews in The Century Magazine, August 1887, article "The Songs of the Civil War." That article isn't a story, but may interest lovers of Civil War music, a topic occasionally discussed here. After the story I'll give links to the songs mentioned by Browne. The many treasuries by Benjamin A.Botkin overflow with such interesting bits. My copy was in his A Civil War Treasury of Tales, Legends and Folklore. It only omitted Browne's introductory paragraph about the earlier article by Brander Matthews influencing him. I strongly recommend at least reading the Wikipedia article on this "Father of Public Folklore" I hotlinked at the start of this paragraph to show his philosophy on folklore and his work at the Library of Congress in the Archive of American Folk Song. You might even want to read the book, America's Folklorist: B.A.Botkin and American Culture, edited by Lawrence Rodgers and Jerrold Hirsch. Each of these songs has background information, so the titles are hotlinked to Wikipedia. Space and time limitations meant it's the only source given here for quick background information. I encourage checking even further because more exists for each song. I try to give at least the melody line and, when available, the chords. I leave it up to you to see if a midi file or video of the song exists to help you learn the songs. 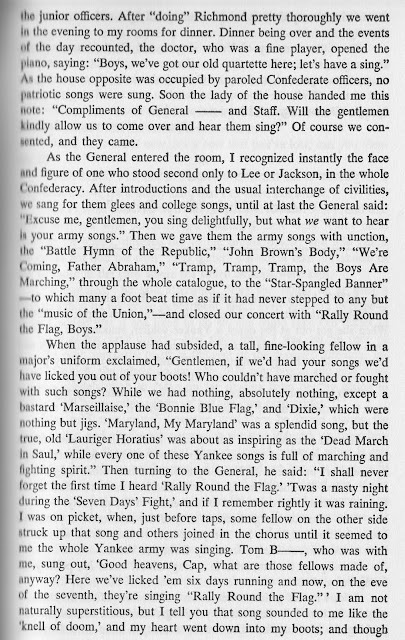 Along the way I discovered the wonderful Civil War Song Book pdf from the Kit Carson's 1st New Mexico Volunteer Infantry String Band, a reenactment group. They have a good list of sources in their introduction to this 82 page book by Joe Dietrich and David Poulin. Their book is specifically chords + lyrics, so I rarely had to worry about chords, just being sure to locate the melody lines on songs. 8 Notes.com was another good resource, but since these are all Public Domain, I made sure the links skipped paid sheet music. For other chords beyond the Civil War Song Book, another resource is Ultimate-Guitar.com. Dead March in Saul this was only mentioned as it is often played at state funerals, including during the trip by Lincoln's body back to Springfield. Serendipity often helped in finding resources. Research tends to go that way, with serendipity ruling! In the meantime may this bit of time traveling through history encourage your own research.